Study of environment helps in sustaining development within a nation and it harmonizes peace with nature . We have to 'return to nature'. It is our responsibility to establish a genial relationship with nature. Kashmiris however have unfortunately suffered from corrupt officials, religious zealots and extortionists. This has left deep scars on our lives, economy and ofcourse-'ecology '. Vale of Kashmir is bestowed with beautiful meadows, streams, rich green forests making it the most unparalleled land on earth. Having said that,the healthy aura of our natural resources has been exploited just for luxury-'without realizing its consequences'. To gauge the nature of these issues,it is essential to know the magnitude of misery inflicted on environment. There have been no strict and effective measures for it till now . Our disaster management has itself proved as a disaster. The other unfortunate fact is the lack of 'environmental education' among the masses. We seriously lack any ethics or civic sense. Erosion in Kashmiri morality has resulted as an erosion in our 'traditional values'-gifted to us by our great saints . It has also introduced a new life style in our traditional culture which opposed our traditonal, home grown values. 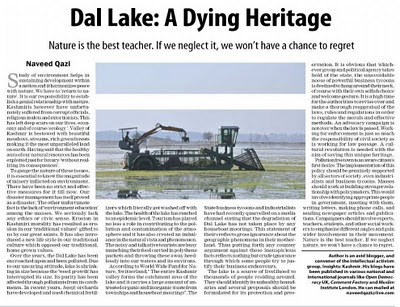 Over the years, The Dal Lake has been encroached upon and been polluted. Due to our uncaring attitude, lake is shrinking in size because the 'weed growth' has interrupted its size. Its purity has been affected through pollutants from its catchments. In recent years, hanji orchardists have developed and used chemical fertilizers which literally get washed off with the lake. The health of the lake has reached to an epidemic level. Tourism has played no less a role in contributing to the pollution and contamination of the atmosphere and it has also created an imbalance in the natural vista and phenomenon. The noisy and talkative tourists are busy munching their food carried in polythene packets and throwing these away heedlessly into our waters and its environs. According to World Wide Fund for Nature, Switzerland,"The entire Kashmir valley forms the catchment area of the lake and it carries a large amount of untreated organic and inorganic waste from townships and houseboat moorings". The State business tycoons and industrialists have had recently quarreled on a media channel stating that the degradation of Dal lake has not taken place by any houseboat moorings. This statement of theirs reflects gross ignorance about the geographic phenomena in their motherland. Thus putting forth any counter argument against these inauspicious facts reflects nothing but crude ignorance through which some people try to justify their business endeavors. The lake is a source of livelihood to thousands of people residing around. They should identify its unhealthy boundaries and several proposals should be formulated for its protection and preservation. It is obvious that whichever group and political agency takes hold of the state, the unavoidable noose of powerful business tycoons is destined to hang around their neck, of course with their own selfish choice and welcome gesture. It is a high time for the authorities to revise over and make a thorough reappraisal of the laws,rules and regulations in order to regulate the morals and effective methods. A cultural revolution is needed with the aim of saving this unique heritage.